Our Plastic Bottle Slides offer an important component of the Wire Bottle Display Racks. Bottles slide to the foremost product position whenever a bottle is removed. The panels are removable from the shelf for easy cleanup. 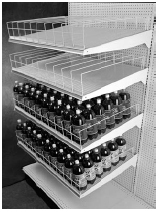 Kits priced below include 1 heavy duty shelf, 1 wire rack bottle display and 1 gravity feed bottle slide. 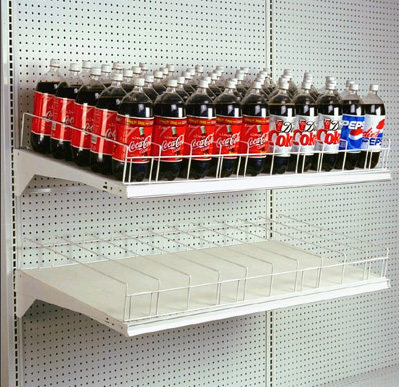 Wire Soda Bottle Divider Kits do not include the necessary wall or gondola shelving system.